I gather from comments that people are enjoying the picture-heavy, travelogue-style posts. I’m having fun writing them, too. 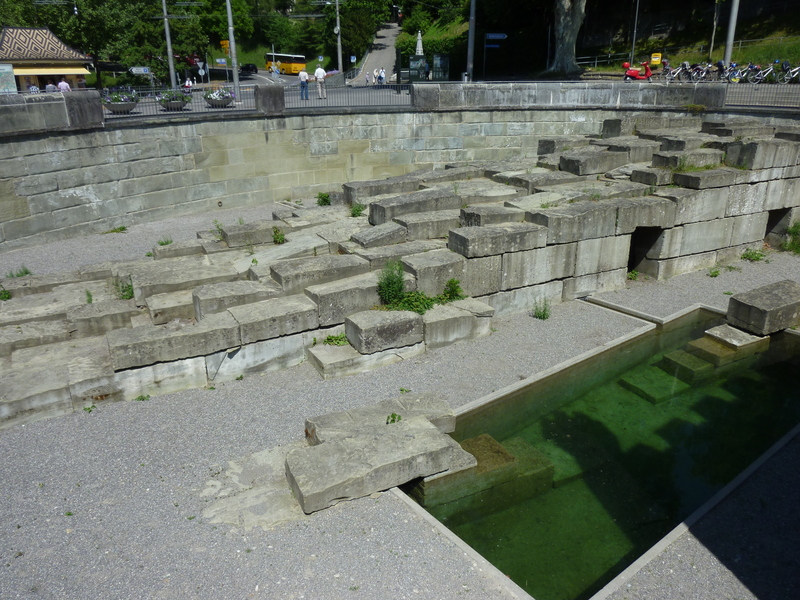 Today I’m going to tell you about the second excursion that Leah and I took outside of the Zürich city limits. 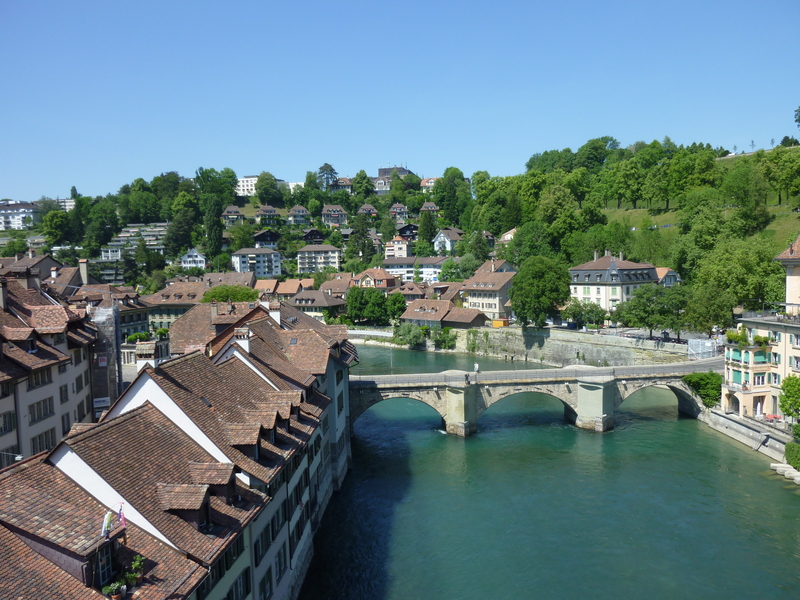 We decided to visit Bern (Berne if you’re French), Switzerland’s capital. 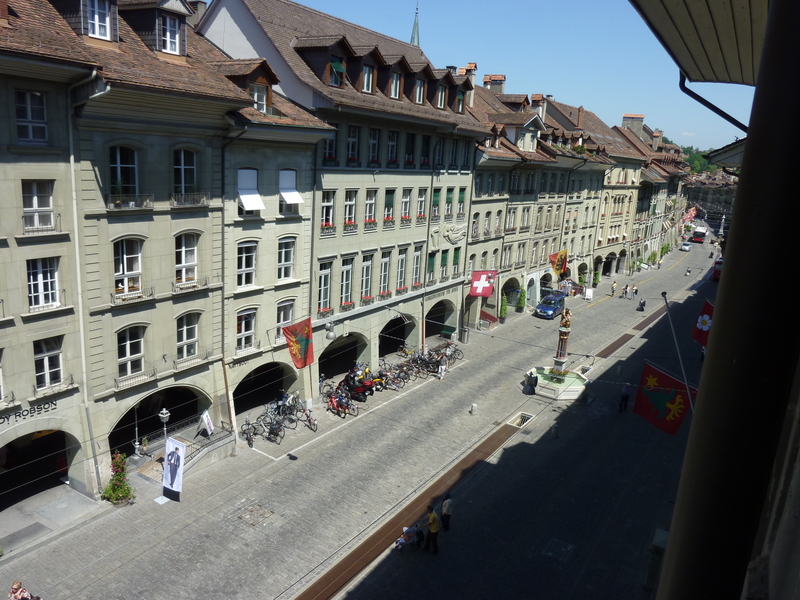 Like other capitals that I’ve visited, Bern is pretty, and, uh, kinda….pretty boring. But nice to look at. Definitely. In my opinion, you shouldn’t come to see the parliament buildings — I didn’t go inside, but from the outside, they were underwhelming. To spare you the visit, I will tell you the interesting facts about the way in which this country is governed, because the system, rather than the buildings in which it is housed and enacted, is what is worth looking into, in my humble opinion. So: in Switzerland, there is no one person (such as a President or Prime Minister) sitting at the top of the totem pole — instead, there are seven Federal Councillors who share power equally (currently, four of them — a majority — are women). 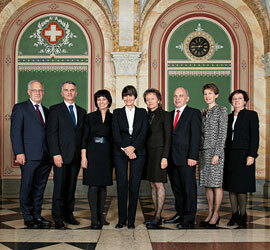 The seven are elected as representatives of several (currently five) different parties according to their number of seats in the Swiss Parliament. Decisions are made jointly by the septet, and there is a policy that once a decision is made (even if it passed only because three against were outvoted by four in favour) all seven will support it publicly — the public is not supposed to know who voted for or against a given motion. Okay, I think that’s enough lecturing. 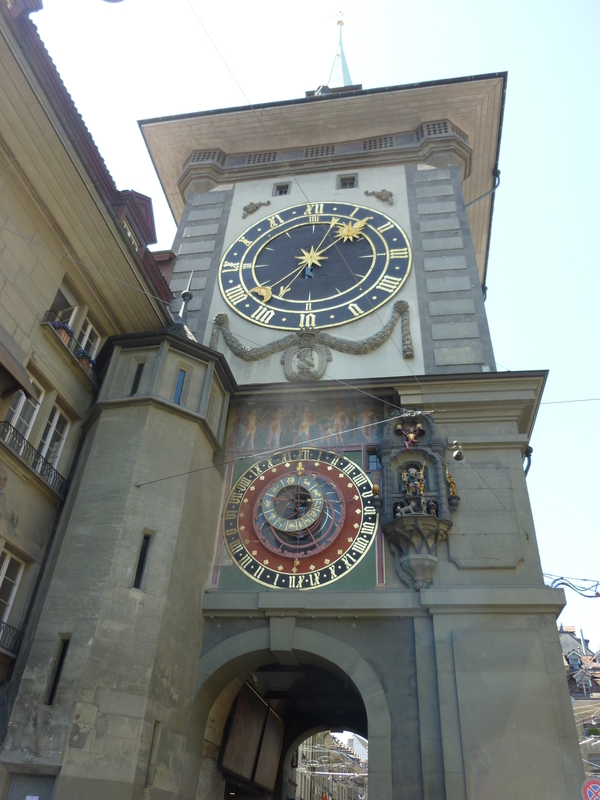 I also wouldn’t go to Bern to see the Zeitglockenturm, a tower with a clock which keeps several different types of time (including current astrological sign). I mean, it’s pretty. But it’s not much to write home on your blog about. You also won’t want to go to Bern just to see this statue of an ogre capturing and eating children. Be forewarned: your Lonely Planet Western Europe guidebook may make this fountain sound like it is a can’t-be-missed highlight, but really it is just a pretty ordinary fountain, and the sculpture sitting atop it is actually not so big and consequently, hard to see or get a good picture of. Don’t worry: Stelian has already accused me, on several occasions, of having become a Europe snob, so there’s no need to scold me again. It was bound to happen, no? 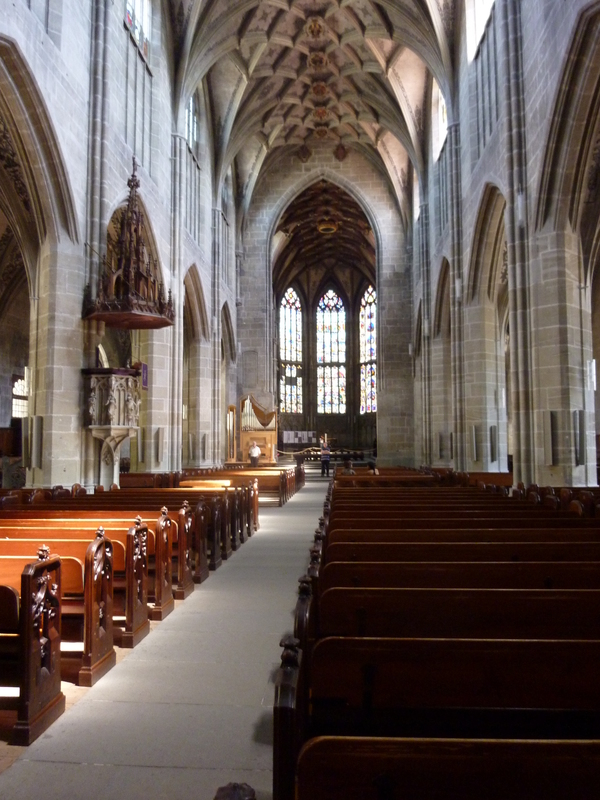 Now, you may have heard of Bern’s Münster. Is this worth a visit? Well, yes. And no. Yes because it has a unique carving depicting The Last Judgement at the entrance that is fun to look at. It also scores points for having a very lovely interior, with beautiful stained glass windows that are not well-captured in the following image (sorry). However — I feel I must bring you the truth, the whole truth, and nothing but the truth — the church’s exterior, and especially its steeple, are currently undergoing repairs. Therefore, you will not be able to take pictures of it to share with your loyal readers. And many of your Bern-skyline shots will be marred by the steeple which, from afar, appears to be wrapped in something bulky, like a giant piece of bubble-wrap. Quel dommage. But wait! I’m not all pessimism and Bern-bashing. 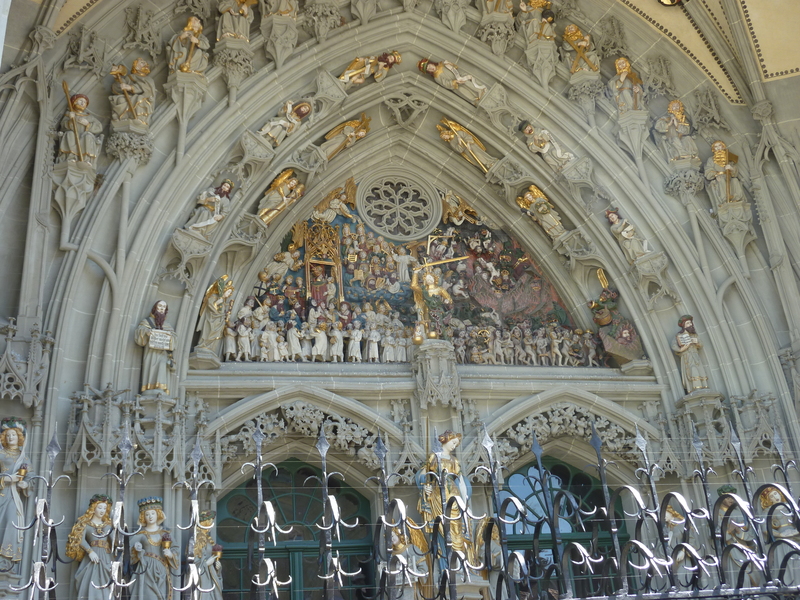 I do think there are several reasons that you might want to visit Bern, should the opportunity present itself. 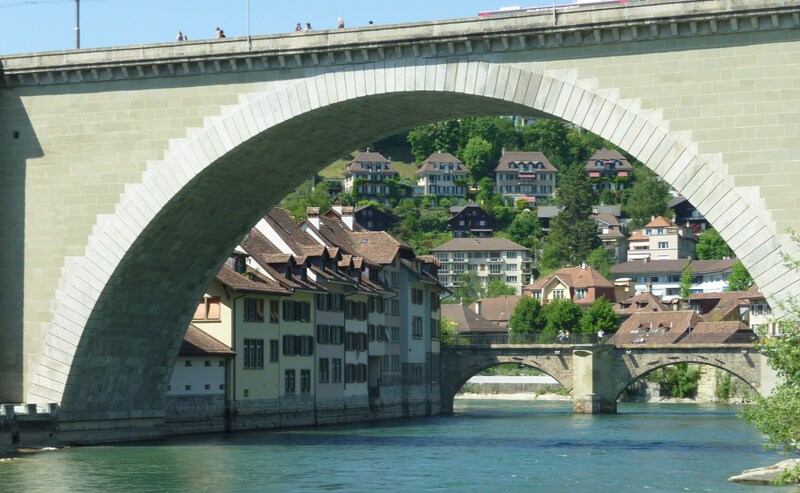 First of all, go to Bern if you like bridges — the River Aare cuts through the city, and the city itself is built high above as well as down close to the river, meaning that there are bridges of different sizes and shapes that are fun to look at and photograph. 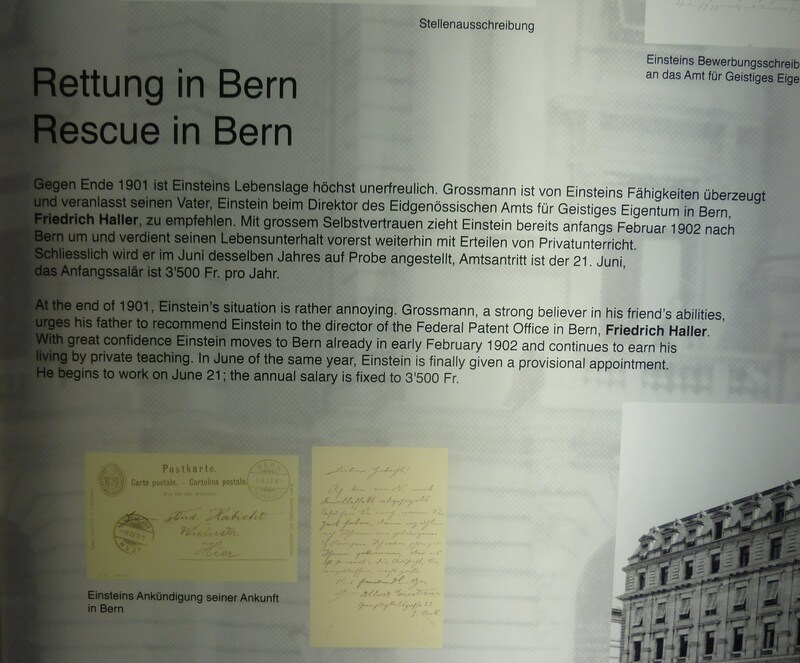 Now, you also might want to pay Bern a visit if you are a fan of Albert Einstein. And really, who isn’t? As a mathematician, my sister might have more legitimate reasons to want to visit Einstein Haus, but I think I enjoyed it just as much as she did. The small museum is housed in the apartment where Einstein lived while he worked as a patent clerk and wrote the series of papers which proved utterly game-changing for him and everyone else. 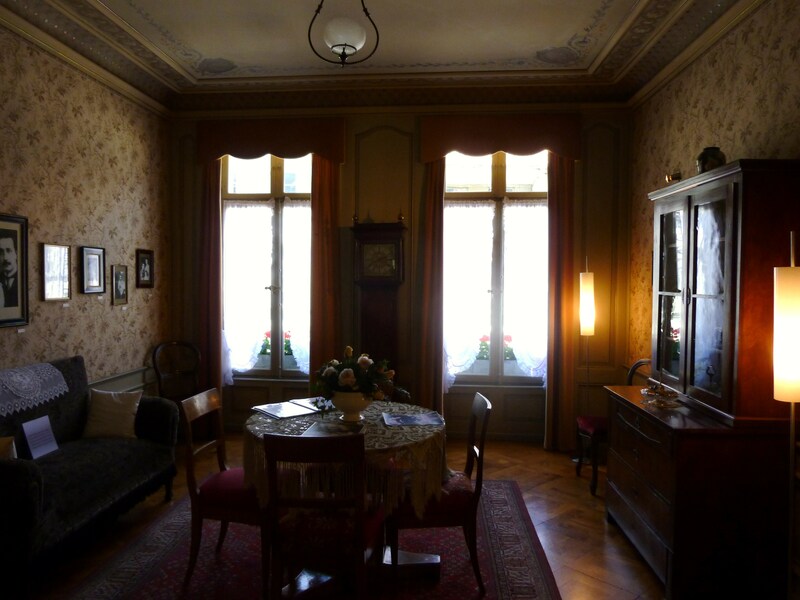 The main floor of his apartment shows the Einstein family’s living room, complete with family portraits, and the upstairs contains a series of placards telling the story of Einstein’s life. I especially enjoyed some of the German-to-English translations on the placards. Where, in German, a period of Einstein’s life is described as unerfreulich, or “unpleasant,” you can see that the person translating to English decided to take a more blunt approach (“Einstein’s situation is rather annoying”). Isn’t it nice to know that a genius such as Einstein could, just like you and me, be downright annoyed with things from time to time? It made me really relate to the man. Touché, Einstein-story translator. 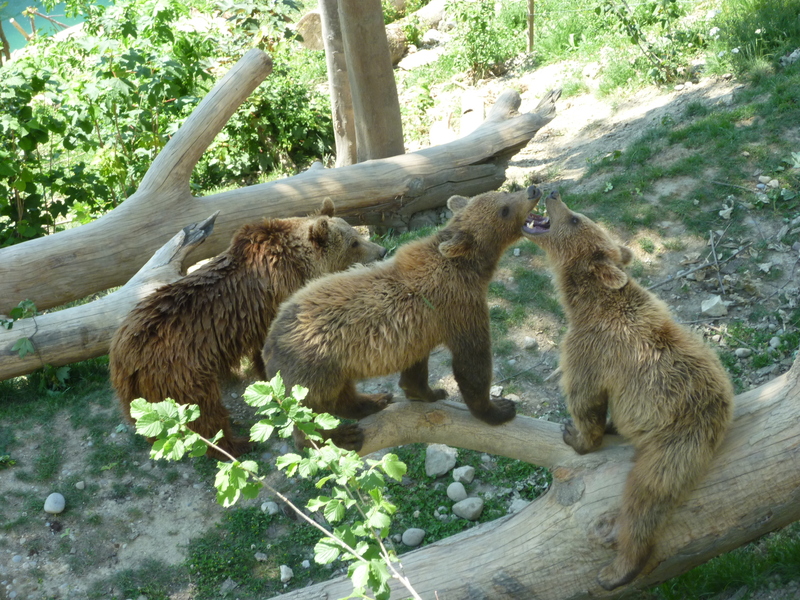 Finally, go to Bern if you like bears. The city was named after them, after all: its founding father, Berchtold V, declared in 1191 that he would name his settlement after whichever animal he first successfully hunted on site. Guess what his first trophy was? But now the bears have larger, grassier accomodations, with trees and an upgraded swimming pool. They looked pretty happy. 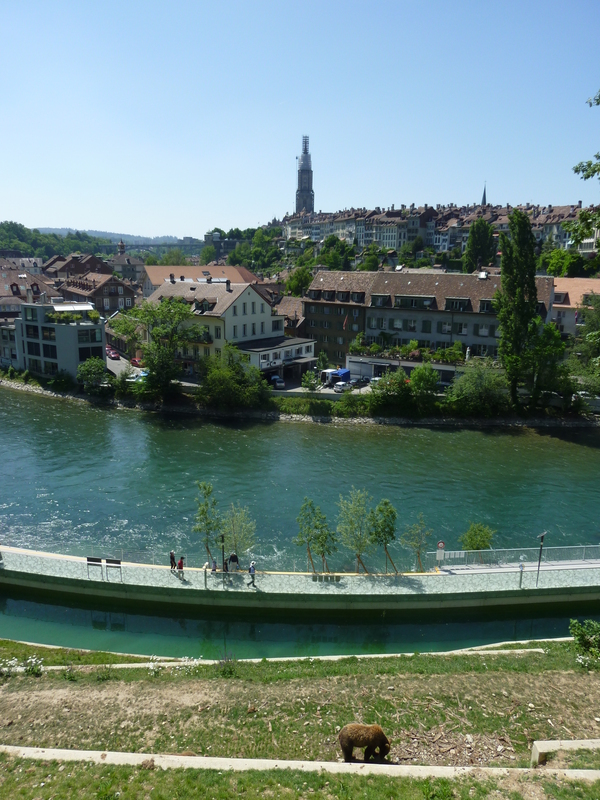 In fact, standing at the new bear enclosure you get a taste of many things that make Bern what it is: the bears, the bridges, the river, the buildings close to and high above it, including the Parliament buildings. Even the bubble-wrapped cathedral is visible from here. Categories: Swissness, Travel | Permalink. Brilliant, Kristen, thank you! Is the ogre part of the cathedral, or is is a secular ogre? Wonderful piece of 3D folklore! Thanks, Kate! The ogre is totally separate — he’s just a fountain decoration in another part of town. It was built in 1544, and is often thought to be anti-Semitic – the ogre is wearing a hat similar to one worn by Jews in the Middle Ages. It could also just be a Carnival figure designed to scare children. 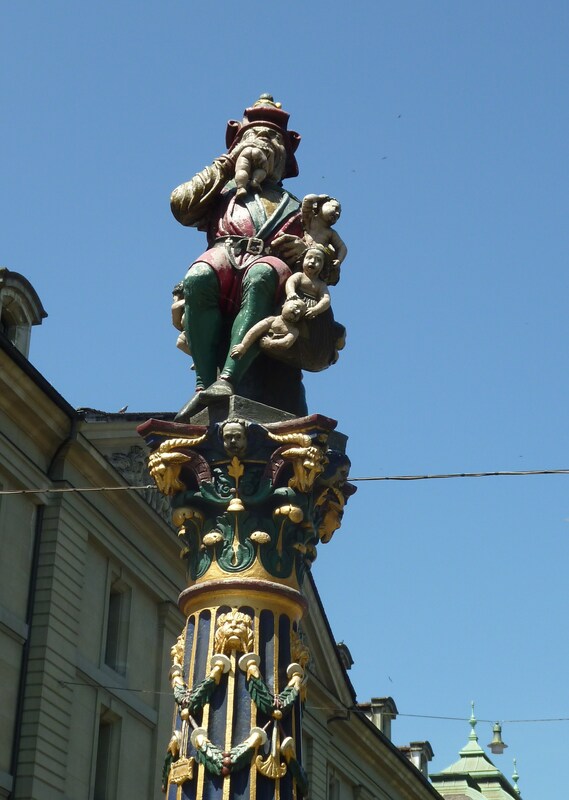 Bern has many medieval fountains, all painted, that have survived the centuries. Much more interesting that a plain stone or metal one. And all with fresh Alpine drinking water gushing out. I’m a travelogue junkie, this is wonderful! That child-eating ogre fountain is quite a sight – makes you wonder about who commissioned it. You didn’t mention that the Zytglogge clock tower houses an astronomical clock that’s been working since the 15th century. Or that the stone arcades that line almost every street are the longest in Europe (at 6km). Or that the city centre is considered by the UN to be a perfect example of civic medieval town planning, so much so that the whole city is a Unesco Heritage sight. Or that on clear days you can see the whole of the Bernese Alps (with the Eiger), not just a few pimples like you get in Zurich! Or, best of all, in the summer you can swim in the river, something I’d never do in London or Paris. 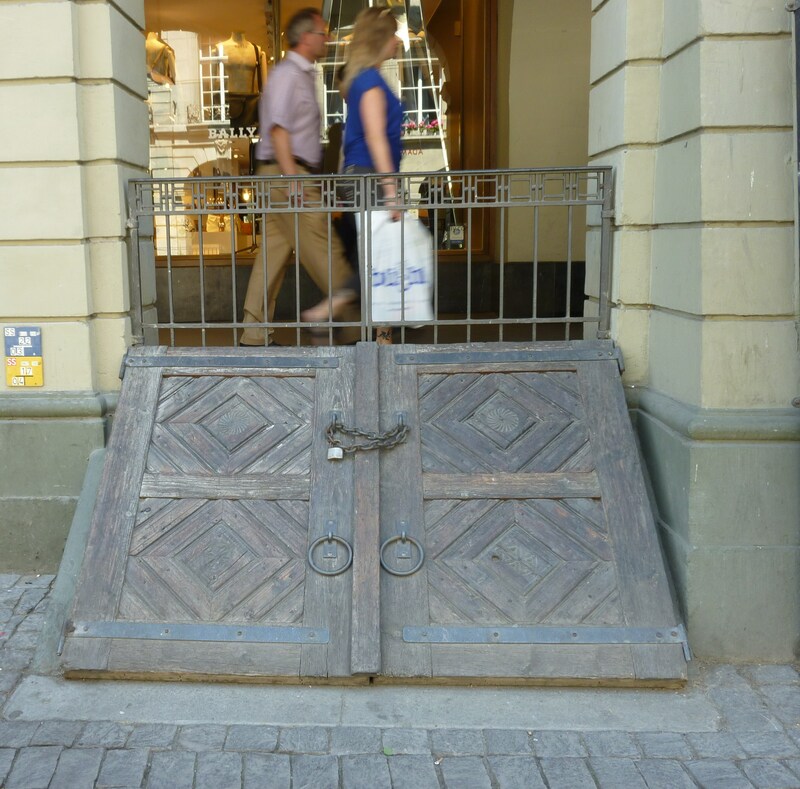 Bern isn’t as big or brash as Zurich but I love its low-key charm. Big isn’t always better. Just got to Basel one day, and then you’ll realise how lovely Bern really is!! By the way, the Federal Council is elected by parliament, not appointed, and there are five different parties, which is why getting an agreement is often hard. And the parliament buildings are much better on the inside (and the tour is free). PS two photo tips for you, as I’m sure you’ll be back to Bern one day! – best view of the Old Town is from Rosengarten. It’s a short walk up the hill behind the bears pits, or bus 10 direct from the station. Lovely picture of the old town tumbling down the hill, which is particularly pretty in winter. – best view of the mountains (on a clear day) fromthe Bundesterrasse behind parliament. Walk thorugh the arch beside parliament, and along to the small park where people play mega-chess. Great panorama of the whole Alps. Thanks very much for your insights. I hope the fact that I was being cheeky, and not truly dismissive of Bern, comes across. I only spent an afternoon there, and I will undoubtedly return. My sister and I were armed only with an out-of-date Lonely Planet guidebook, which didn’t let us in on many of the things you’ve offered above. Next time I go, I will be better prepared. Thanks again!